Weekly Rates - Less than 7 nights -Nightly rate $285 - Min 3 nights. This beachside penthouse is the upper portion of a unique and beautiful 2 VILLA duplex beach house located in Deerfield Beach, Florida. Both villas are independent and distinct from the other with separate entrances, exits, patios & bbq's. LOCATED directly on North Ocean Blvd. (A1A) and 100 ft. To the Atlantic Ocean. A short stroll to all the Ocean front restaurants with live entertainment and oceanfront boardwalk and Wynham Hotel. Our luxuriously designed beachside Villas are created for guests desiring a first class, comfy, impeccably clean and manicured South Florida coastal vacation home away from home. Front furnished large balcony, rear terrace with umbrella table & BBQ. Also as a exclusive patio with two lounges set in a tropical lush garden. This trendy chic Beachside Penthouse welcomes you with swanky modernist white leather sofas, chairs, desk, art, 42" Sharp HDTV, DVD Player and music CD player with speakers in each room. The King Size Bedroom has an inviting four poster bed and a wall mounted 32" Sony HD TV. A custom marble spa bathroom. The Single Bedroom features marble floors with hurricane sliding glass doors opening to a large furnished ivory marble balcony inundated with Atlantic Ocean breezes. Granite kitchen with a landscape lit terrace and built-in umbrella table and also features a private Infra-red grill. Enjoy fragrant salty sea mist air and view majestic ocean pelicans gliding in perfect sequence in front and above this Beachside Penthouse just steps from the Atlantic Ocean. 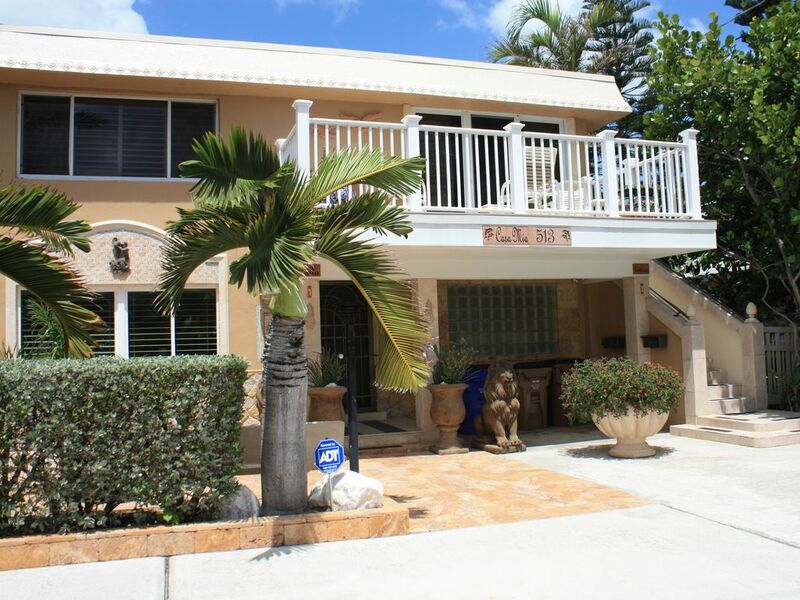 BEACHSIDE VILLA: (SLEEPS 4) King Size Bedroom, Full Bathroom, Queen Size Bedroom with walk-in marble shower, private 41 Jet Therapy Spa, adjacent Outdoor Heated Shower and 3 furnished adjoining patios with private gourmet grill. An International Historic Fishing Pier is just steps South and the nearby Atlantic Coast offers plenty of Waterfront Activities including SURFING LESSONS, Snorkeling, Professional and non professional beach volleyball tournaments, Bike & Moped rentals, village Shopping. Just over the bridge at the Cove Marina are Scuba Diving Lessons, Boat & Wave Runner Rentals, Deep Sea Fishing Charters and Intra coastal waterway sightseeing tours. RIDE YOUR BIKES ALONG SCENIC ROUTE A1A aka: North Ocean Drive/Blvd. And visit Beautiful Ocean Front Parks: (2) Gumbo Limbo Environmental Complex and Spanish River Park (Both 5 Stars). Bike & Moped Rentals just around the corner and walking distance. SPECTACULAR!!! FIREWORKS DISPLAY JULY 4TH. BOCA RATON BEACH just 1/4 block away. BOCA RATON'S Upscale Restaurants, Hotels and Entertainment ONLY 1 mile away. EVERGLADES HOLIDAY PARK: TAKE AN AIR BOAT RIDE around the fascinating FLORIDA EVERGLADES, which is full of indigenous wildlife and eco- tourism. The City is host to the Women Professional Volleyball Association Tour and Super Boat Power Race. If you anticipate any problems we suggest that you please purchase a travelers insurance policy. Here is a web site that you can visit for travel insurance: Travel Guard. Also recommend that you check with your own insurance companies for such protection. Location Location Location: The Atlantic Ocean and the Beach, Ocean Front Restaurants, Live Entertainment and Boca Raton just a stone's throw away with upscale restaurants, golf courses and shopping. Ocean Breezes, Sub-Tropical Paradise and Creative Luxurious Accommodations. Quality prevails once you drive into the driveway. Ana is a pleasure. Her commitment as a host is duly noted and most respected by these travelers. The apartment is in the perfect location: close to the beach, a scenic walking trail along A-1-A, delicious restaurants (especially in Boca), grocery stores & shopping. It's spacious and clean with a "beachy mediterranean" vibe. The kitchen was well equipped and the king-size bed was very comfortable. My husband and I thoroughly enjoyed our stay there! Thank you, Ana, for being such a wonderful hostess. You both were a true pleasure to host. Delightful in fact. Thank you very much again for your stay and lovely 5 star review. We just left south Florida and miss it already. The beach side penthouse and villa was gorgeous and convenient to everything. We got there on there on Wednesday and didn't drive our car until we left on Saturday. The villa is the most comfortable and beautiful space we've ever rented from VRBO. If you are looking to stay on the Atlantic, rent this place, you will be in heaven! Your joy inspires where most needed. I thank you so much for your stay and your lovely sentiments are my treasure. We (three of us) stayed here for six nights and really enjoyed it. The penthouse is close to the beach (a three minute walk), and within walking distance to everything in town. Ana keeps the property in immaculate condition!! The penthouse is the top floor of the property and was very quiet and private. We definitely would stay here again and highly recommend to others. Thank you so much Ken & Jennifer. The beach and restaurants are a stone's throw away from the property. The owner was extremely helpful in working with us regarding arrival and departure. The beach was quiet and private, which is what we were looking for. This was our second trip to Deerfield Beach but our best so far. Thank you very much again for your stay. Our Villa was beautiful and we appreciated all the big and little touches that Ana provided to make it feel like home. I appreciated that there were additional spices and things to cook with so that we didn't have to add that to our grocery list. The supply of towels and comfy big bed all added to our enjoyment. Would definitely come back to stay again. A charming couple and pleasure to host. Your 5 star lovely review is truly appreciated. Thank you again sincerely for your most gracious stay! A Vacation Agreement and copy of a government issue photo Identification required. Driver's license or passport. Copy of Credit card required.